In February, Octopus Energy launched the first smart ToU tariff, Agile Octopus, offering consumers half-hourly pricing reflecting the real prices at which Octopus buys electricity in the day-ahead market and the various network and other costs that apply. Agile customers are able to check their prices for the following day online and through an app at 4:30pm every day, allowing them to see when the cheapest times will be the next day, and enabling them to make decisions about consumption based on these prices. The tariff also includes a cap at 35p /kWh, to protect customers from the effects of market price spikes. Octopus analysed the behaviour of its Agile customers after being on the tariff for six months and found that 28% showed a statistically significant change in peak time usage, dropping peak usage from 16% to 11.5% of their daily consumption. This resulted in a reduction in peak demand of an average of 15.62 kWh per month. Overall, peak use was reduced by 28.19%. They also found that the more engaged Agile customers saved the most money – the top 25% most engaged customers saved £91 compared with an Octopus 12 month fixed tariff, and £229 compared with the average large legacy supplier standard tariff. Electric vehicle drivers were found to change their behaviour the most, achieving savings of £132 on average, compared with an Octopus fixed tariff. The most active Agile EV customers dropped the proportion of power they used in the peak period by 47%. Of course this sounds very encouraging, but two things should be kept in mind. The first is that the sample size is very small – it is not mentioned in the report, but according to the company, the report is based on 149 Agile customers. Octopus has around a quarter of a million customers in total, so this is a very small proportion of the company’s customer base, and an even smaller proportion of GB consumers as a whole. The other point is that these customers are early adopters and are likely to be significantly more engaged than the average consumer. A 2017 study by the University of Waterloo found that smart meters and time-of-use electricity pricing had “only modestly reduced” residential demand peak periods. Researchers compared data for the nine months before and after the introduction of ToU rates in November 2011 by an unidentified distribution company with more than 20,000 household customers in southwestern Ontario. After adjusting for weather differences, their analysis showed residential electricity demand just 2.6% during on-peak periods and 2.4% during mid-peak periods following the change. 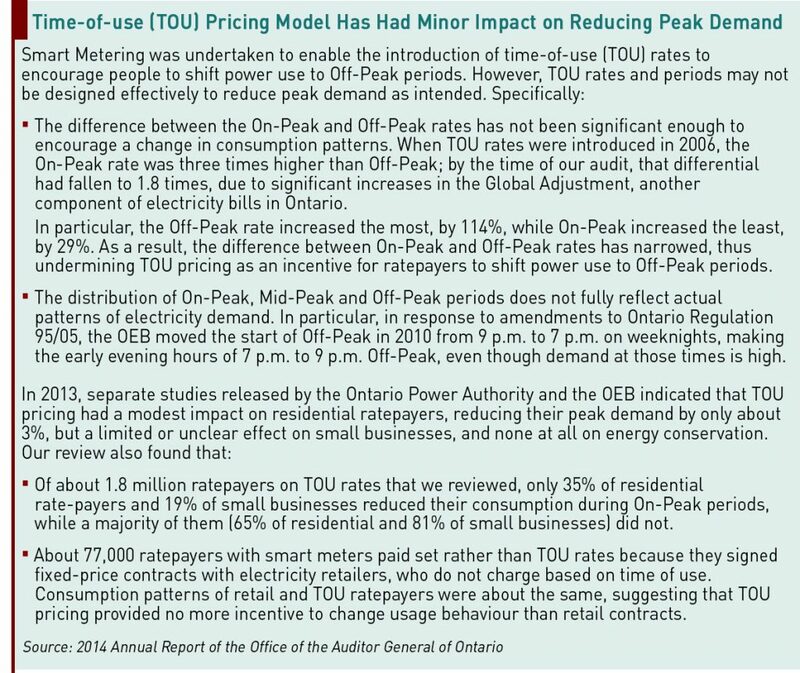 This is consistent with the findings of the Office of the Auditor General of Ontario in 2014 (see box below) which also identified a small change in consumption patterns, blaming poor tariff design with too small a difference between peak and off-peak rates. Analysis by The Brattle Group examined load shifting and conservation impacts of ToU rates on residential electricity use in Ontario from their inception in 2009 when some local distribution companies began to offer them, through to the end of 2014. All distribution companies were required to use ToU tariffs from 2011. The chart above shows the impacts of ToU pricing on electricity demand during the summer peak period as a percentage change in usage relative to what would have been consumed in the absence of ToU rates. A negative impact represents a reduction in energy use, and the black brackets show the 95% confidence interval (a small interval lying far from zero indicates a high degree of confidence). For the province as a whole, consumption fell by 3.26% in the pre-2012 period, 2.27% in 2012, 2.00% in 2013, and 1.18% in 2014 in the summer peaks. Brattle also estimated load shifting impacts for the winter, and found them to be generally smaller and also decreasing over time. There was no evidence of energy conservation. 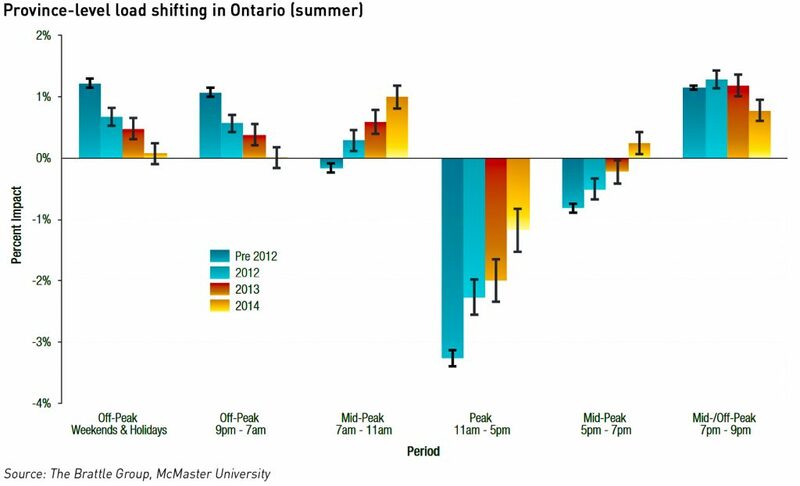 The second chart shows residential load shifting across all periods in the summer for the whole province. In 2014, there is evidence of increasing load shifting into the mid-peak periods relative to prior years. Brattle concluded that had the difference between peak and off-peak prices been larger, the observed load shifting would have been greater. Recent research from Citizens Advice found that the value of ToU tariffs to the system as a whole is modest in properties without electric heating and/or electric vehicles (“EVs”). It also found that real time pricing could provide much more value when combined with automated controls. Citizens Advice commissioned Ipsos MORI to undertake quantitative interviews with 502 legacy ToU consumers and found that only around half of consumers were actively trying to use electricity at off-peak times to save money. Those less likely to change behaviour included consumers on high incomes who were unconcerned about costs; younger households, particularly those with children, who were less able to change their usage patterns; and households with more people. There were also simple, practical reasons why households wouldn’t shift demand – while some appliances such as ovens need to be used at certain times of the day, others such as washing machines which could be used at any time were often not used overnight due to concerns about safety or noise (fire brigades often advise against using appliances overnight, when unattended). 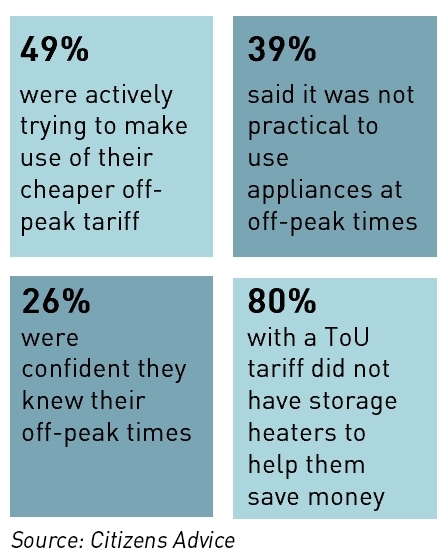 39% of respondents said it was not practical for them to use appliances at off peak times, and 28% said it wasn’t practical for them to heat their homes at off peak times. Only one in five of the households surveyed had a storage heating system in their home, which are specifically designed to use more electricity at off-peak times. ​As heating is generally the largest contributor to annual energy bills, ​households without storage heaters are unlikely to be getting the most out of their ToU tariff. The survey also identified consumer concerns around poor information about the details of their tariff, with key details such as exactly when the cheaper off-peak rates were available often not known. According to Citizens Advice in some cases suppliers themselves do not have detailed information about every meter and its settings meaning they are not able to accurately set out exactly when the cheaper hours are for all customers. There was also evidence that legacy ToU consumers face issues when trying to switch supplier, including suppliers being unable or unwilling to serve them; an inability to find an attractive ToU deal; being unable to use price comparison sites reliably; and being charged additional fees to replace meters. Consumers with DTS systems reported even more problems, with some saying they felt trapped on their system because of the high cost of replacing it – the report cited one customer who tried to switch and was told a standing charge would be applied to all four of the existing meters in the property, which was cost prohibitive. DTS meters are also often found in social housing or rental properties, which can tie the bill payer in further if landlords are unwilling to fund or agree to the change. As well as issues of choice, some DTS consumers also found the lack of control over their heating to be a problem. Many DTS properties are poorly insulated, with ageing heating systems – meaning the occupants weren’t even getting an acceptable level of heat for the amount they paid. Out of the over 350 cases reviewed by Citizens Advice, a third had been referred to its Extra Help Unit, suggesting that a high proportion legacy ToU consumers who ask for help are also vulnerable, and may be particularly at risk from increased costs, or an inability to heat their home. As the Government progresses its de-carbonisation agenda in the transport and heating sectors, electricity demand will rise, which is a major driver of the interest in time-of-use pricing. From a retail perspective, the conclusions of the Citizens Advice analysis that consumers with electric vehicles and heating could contribute the most to load-shifting in response to ToU tariffs is probably correct. The Octopus Energy analysis would also suggest that the more engaged energy consumers, and early adotpters will contribute more than dis-engaged consumers (which is self-evident) with the question being how many engaged versus not engaged consumers will there be, and whether this is enough to make a meaningful difference at the system level. Either way, time-of-use tariffs by themselves are probably not enough to secure desired system-wide consumption effects. Rate differentials need to be sufficiently large to motivate changes in behaviour, and there need to be enough flexible appliances available that are convenient to use at different times of the day. This is straightforward with EVs but less so with heating and other domestic appliances as illustrated by the Citizens Advice research. The time-of-use reality is unlikely to match up to the hype.